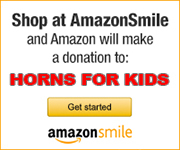 Horns For Kids, Inc. is a tax-exempt (501c3) non-profit organization that supports deserving school music programs throughout Connecticut. Our main purpose is to encourage children to experience the thrill of performing music in school, and as a life-long activity. 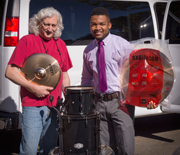 H4K raises funds through private and corporate contributions -- and awards clean, playable instruments to deserving school music programs throughout Connecticut. We accept donations of new and gently used instruments, have them refurbished, and distribute them to deserving Connecticut schools. Since 2003, H4K has helped over 400 Connecticut schools. CLICK HERE to see every instrument Horns For Kids has awarded. Click on blue banner to make contribution. Your tax-deductible contribution to Horns For Kids is urgently needed for repair of donated instruments. Even a contribution of $5-10 dollars can make a big difference. Simply click on the Blue Button above to go to the Contributions page. All funds received are used to support students in deserving school music programs throughout Connecticut. CLICK BELOW TO LEARN MORE ABOUT RMHC. 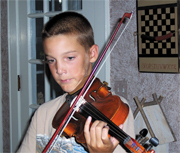 See the National Opportunity-To-Learn Standards for Music Instruction in Schools K-12. Teachers: Click Here for Ten Ways to Promote Your Music Department. Click on button for web page. CLICK HERE to watch an extraordinary Q & A Session wth Wynton Marsalis, members of the Jazz at Lincoln Center Orchestra and high school musicians participating in the 2015 Essentially Ellington festival in NYC. It is a bit long (1:34), but fascinating discussion between the students and some of the best professional jazz musicians in the world. They discuss what jazz is, how to approach it, how to practice and play it, and how it is relevant to real life. This video is highly recommended for teachers, students, and anyone interested in jazz as a possible career. Arturo Sandoval, celebrated trumpeter, pianist and composer, received the Presidential Medal of Freedom in 2013 at the White House. Born outside Havana, Cuba, he became a protégé of jazz legend Dizzy Gillespie and gained international acclaim as a dynamic performer. He defected to the United States in 1990 and later became an American citizen. He has been awarded nine Grammy Awards and is widely considered one of the greatest living jazz artists. Click on the link under the photo above to view an excerpt from his speech (:47 seconds). CLICK ON PHOTO ABOVE TO SEE LARGER VERSION. Christian Heritage School in Trumbull was awarded a Bass Clarinet on May 12, 2015. 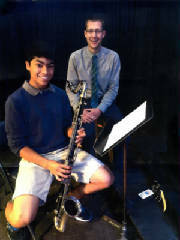 Brett Flowers (right), music teacher, is shown here with a student who is excited to be playing the instrument. Fred Rossomando, co-director of Horn For Kids, was interviewed by Ann Nyberg at WTNH-8 on Tuesday, May 12. Ann was very gracious to invite Fred on the program to discuss how Horns For Kids continues to support music education in Connecticut by supplying instruments to needy schools throughout the State. CLICK HERE or on the photo above to see the entire program (23:09). EDISON MS MERIDEN RECEIVED A VIOLA 11/11/14. Waterbury Arts Magnet School received drum set. Woodbury Middle School was awarded a Musica-Steyer baritone horn on May 13, 2013. Accepting the instrument for Woodbury Middle School was Amy Perras (see above), instrumental music teacher. Also pictured above is Bill Geddes, former music coordinator for the Region 14 School District. BarryFest, a celebration of the life of Mancheshter native, Barry Grant, took place on July 14, 2013, at a Manchester restaurant. Eight of his favorite bands performed as a tribute to Grant, who was their friend and avid supporter. About 300 of Grant's closest friends attended and donated $2,000 dollars in his name to benefit Horns For Kids. Grant who passed away in October, 2012, won many awards for his radio programs on WPLR and WDRC, including Billboard Magazine's Personality of the Year. READ THE FULL STORY HERE. For the second year in a row, the Darien High School chapter of Tri-M Music Honor Society has raised significant funds for Horns For Kids. Under the direction of Chapter president, Jeffrey Sload, the Darien HS chapter raised $2,400 dollars for Horns For Kids during this past December/January Holiday Season. We are very grateful for the work of these students who organized the drive on their own. They have made it possible for other deserving students in Connecticut to experience the thrill of making music. And at the same time they have shown by their example that doing for others is what the Holiday season is all about. 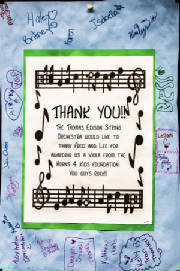 Horns For KIds is thankful for their contribution to music education in Connecticut. CLICK HERE TO PLAY CLAPTON VIDEO CLIP. Test your musical knowledge. CLICK ABOVE. FILL OUT FORM BELOW FOR DIRECTIONS TO H4K. Horns for Kids awarded 51 instruments to CT schools on Tuesday, October 30. We will have more instruments available in late April or early May, 2019. If you are not on the Horns For Kids E-Mail News List, but would like to be, see the article below. You'll receive advance notice when the next group of instruments is available. 54 instruments were awarded to Connecticut schools on Tuesday, November 7. There were 62 schools that applied. Be sure to join the H4K E-Mail News List to be notified in advance when more instruments are available. Horns For Kids awarded 63 instruments to Connecticut public and private schools on May 10, 2016. Click on the following link: INSTRUMENTS AWARDED, or click on the searchlight above, to see the list of schools that received instruments. If you'd like to receive advance notice when the next group of instruments is available, please submit your e-mail address to the Horns For Kids E-Mail News List below. Horns For Kids awarded twelve re-furbished snare drums to eight CT schools on Monday, March 14, 2016. Each drum came with a new snare drum stand. To see the list of schools that received a drum go to the INSTRUMENTS AWARDED page. 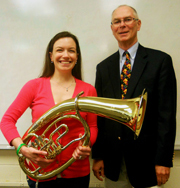 Horns For Kids awarded 62 instruments to Connecticut schools on May 12, 2015. CLICK HERE or on the moving banner above to see the list of schools receiving instruments. There were 88 applications for the 62 instruments. So it was not possible for each school that applied to receive an instrument. We plan on having more instruments available early next October, 2015. Be sure to join the H4K E-Mail News List (see below) to be notified in advance when more instruments are available. Horns For Kids awarded 47 instruments to schools on November 11, 2014. CLICK HERE to see the list of schools receiving instruments, or go to the "Instruments Awarded" page. There were 88 applications for the 47 instruments. This is the largest number of applications we have ever received. There is an urgent need for donated instruments. If you know someone with an instrument not being used, please have them call us at 203-288-9771. We'll put it in excellent condition and award it to a deserving Connecticut scnool. With your help, Horns For Kids will have more instruments available in the spring of 2015. To receive advance notice when more instruments are available, join the "Horns For Kids E-Mail News List" below. 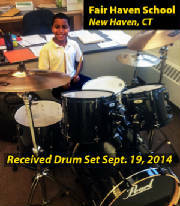 Eight Drum Sets were awarded to Connecticut schools on September 19, 2014, to schools in Bridgeport, Derby, Hamden, New Haven, and Middletown. There were 17 applications for the 8 sets. In October, Horns For Kids will have several dozen more instruments (woodwind, brass, string and percussion) available to schools. If you have subscribed to the Horns For Kids E-Mail News List (see above), you'll receive advance notice when they are available. Horns For Kids awarded 46 instruments to Connecticut schools on Monday, May 19, 2014. We received 57 applications. To see the list of schools awarded instruments, CLICK HERE, or on the searchlight banner above. Join the E-Mail News List below to receive advance notice when the next group of instruments are available. Horns For Kids awarded 52 instruments to Connecticut public and private schools on May 13, 2013. There were 65 applications. To see the list of schools receiving instruments, CLICK HERE, or on the banner above. There will be more instruments available to schools this Fall. Check back here frequently. If you have subscribed to the Horns For Kids E-Mail News List (see below), you will be notified in advance. 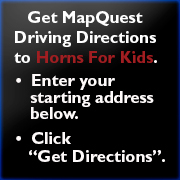 Watch a QUICKTIME MOVIE about Horns For Kids. CLICK BELOW. Click here to play movie. Hear Sound Clips from the Album.